The technology group Wärtsilä, Finland’s Lappeenranta University of Technology (LUT) and Nebraska Public Power District (NPPD), the largest electricity utility in the state of Nebraska, have signed a Memorandum of Understanding (MoU) for the study of the development of a business case for the use of alternative fuels with Wärtsilä generating sets. The MoU was signed on 13 November. The aim of the business case is to achieve a technically and commercially viable solution that will allow NPPD to proceed with an industrial scale pilot project. Both parties have expressed the intention that this initiative will help accelerate the move towards a future where energy will be produced from 100 percent renewable carbon free sources. The specified alternative fuels include methanol, dimethyl ether (DME) and ammonia, synthesised from hydrogen, CO2 and nitrogen. “We are delighted to be working with Wärtsilä and LUT University on this very important project. By converting hydrogen to methanol, it will be possible to use this as fuel in Wärtsilä engines. This has dual benefits, since it helps us commercially while at the same time promoting an environmentally sustainable means for producing electricity,” added NPPD CEO and President Pat Pope. “This collaboration between our two companies is fully in line with our Smart Energy Vision for sustainable power generation. The energy sector is changing for all stakeholders, and Wärtsilä is harnessing its extensive capabilities to lead that change,” commented Mikael Backman, Regional Director, USA & Canada, Wärtsilä Energy Solutions. “For LUT University, this is an important collaborative initiative in the research and utilisation of Power-to-X technology. We are pleased to have the opportunity to collaborate with global players and we are thrilled that it's all starting in the United States of all places,” says Juha-Matti Saksa, Rector, LUT University. 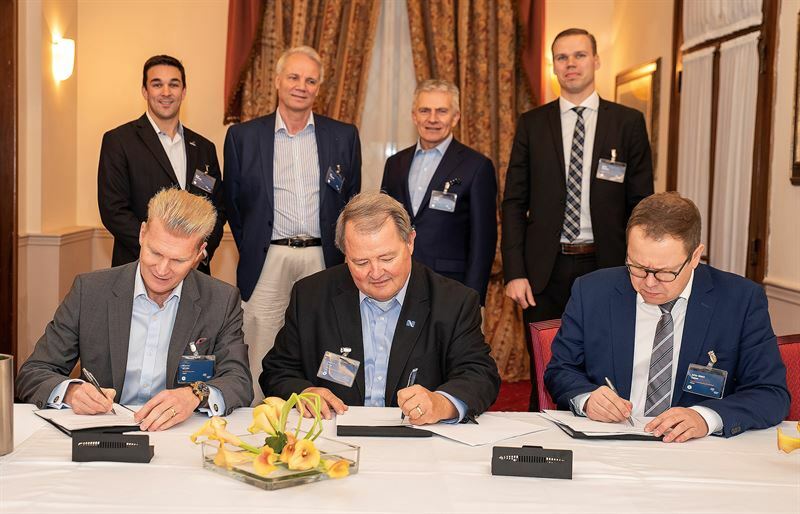 Together, the parties will evaluate performance and commercial information on the various fuel capabilities of Wärtsilä engines, provide input for the economic model, and develop an economic evaluation model. By demonstrating the results with test engines, it is envisioned that the conversion of hydrogen to methanol using CO2, and then burning the methanol as fuel to produce electricity, will be successfully established. This will have a major impact on future fuel choices for the global energy market. Image caption: Back row, left to right: Ryan Kennedy, Business Development Manager, Wärtsilä Energy Solutions; Jussi Heikkinen, Market Development Director, Wärtsilä Energy Solutions; Jaakko Eskola, President & CEO, Wärtsilä Corporation; Matti Rautkivi, Director, Sales & Marketing, Wärtsilä Energy Solutions. Front row, left to right: Marco Wiren, President, Wärtsilä Energy Solutions; Pat Pope, President and Chief Executive Officer, NPPD; Juha-Matti Saksa, Rector, Lappeenranta University of Technology (LUT).